The Five of Cups stands for an emotional crisis. It might be that unconscious fears come true, it could tell that feelings are disrupted or wasting away, the soul is empty and unfulfilled. In the sequence of the cups, the Five is the logical consequence of the Four. The grey tristesse that was lurking behind the luxury's glamour is now exposed, the 'truth is out'. 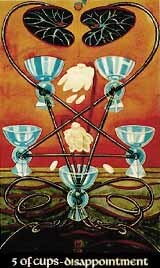 The Five of Cups implies the loss of illusion, the realization of a deception. It hurts, but is necessary when we don't want to spend the rest of our lifes with our heads in the sand. The 5 is the quintessence, the power that exceeds the 4 - Geburah is motion and changing, the power of destruction. To put it plain: we have to learn how to crawl before we can learn to walk.